As far as titles go, ‘smallest snail’ isn’t really the one you’d like, but that’e exactly what Acmella nana will have to settle for. The tiny mollusk measures only 0.033 inches (0.86 mm) on average. A tiny snail from Borneo is the smallest ever found, smaller than a period on a printed page. 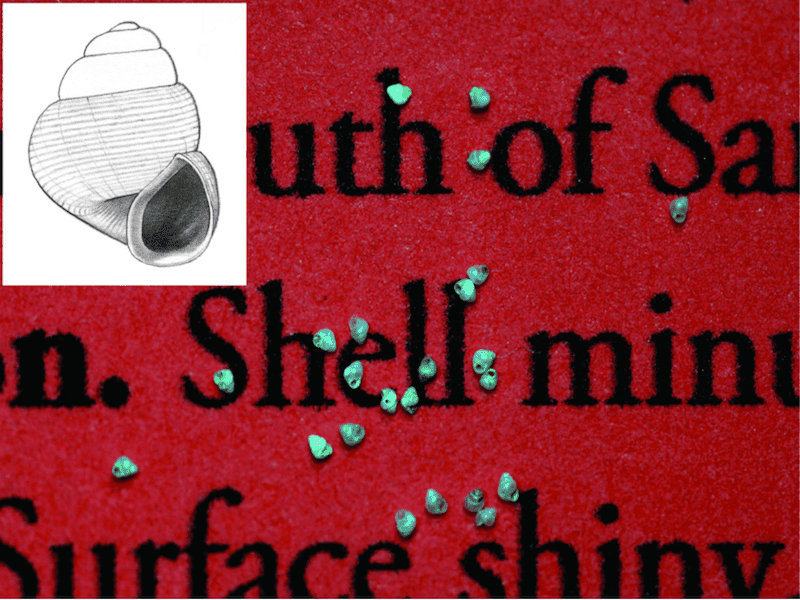 Identifying the shells in the wild required a microscope, researchers say. When the biologists set out to find small snails, they knew exactly where to go; the limestone hills of Borneo area ideal because the shells of snails are built from calcium carbonate, the main component of limestone. The collection process is actually pretty crude. “When we go to a limestone hill, we just bring some strong plastic bags, and we collect a lot of soil and litter and dirt from underneath the limestone cliffs,” said co-researcher Menno Schilthuizen, a professor of evolution at Leiden University in the Netherlands. They sieve the contents, throwing away the larger objects into a bucket of water. “We stir it around a lot so that the sand and clay sinks to the bottom, but the shells— which contain a bubble of air — float,” Schilthuizen said. They then scoop the floating shells and sort them by size, using a microscope; usually, there’s a lot of them. “You can sometimes get thousands or tens of thousands of shells from a few liters of soil, including these very tiny ones,” he said. Researchers hand’t observed the species in the wild, so they don’t know what they eat or their breeding habits. However, they likely do many of the things that other small snails do – foraging on thin films of bacteria and fungi that grow on wet limestone surfaces in caves. Due to its favorable conditions, Borneo boasts a large mollusk diversity, with over 500 snail species, but they are all very vulnerable to external influences, especially human influences. For example, a species can be limited to one limestone massif, and this limestone is quarried intensely. Scientists have already documented at least one species destroyed because its entire habitat was mined. In addition to Acmella nana, researchers discovered another 47 snail species. The research is published in Zoo Keys.